Svalbard is the cradle of LT&C. The following description is the story of an impressive example that highlights how cooperation between tourism and conservation resulted in an increase of well-managed national parks and other protected areas. Coinciding with Norway’s celebrations of the 75th anniversary of the Svalbard Treaty and the country’s sovereignty over the 62,700 km2 far north archipelago in 1995, a major threat to the pristine wilderness appeared. A coal company planned to construct the first long-distance road through the archipelago’s largest green tundra area known as Reindalen. The implementation of that plan would have been the first in a series of infrastructure events that would have had extremely negative consequences for the future of Svalbard. And in particular other Svalbard Treaty members could have insisted on their right to follow that example of Norway and build their own roads and produce related damage to nature. 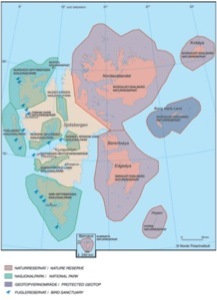 This served as the impetus of the formation of a coalition of conservation NGOs (WWF, Friends of the Earth Norway (NNV) and Birdlife Norway (NOF)) and tourism bodies (the Norwegian Trekking Association (DNT), and later the Dutch “Oceanwide Expeditions” and German “Spitzbergen Tours”). 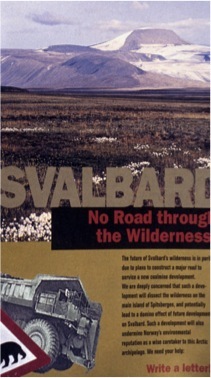 A campaign entitled “No Road trough Svalbard Wilderness!” was started. A four-page folder was produced and people were asked to send a postcard to the Prime Minister Gro Harlem Brundtland. The time was right and the unique coalition produced incredible political weight and results. Approximately 4000 postcards were sent to protest the Svea road and they had an impact on the Norwegian Parliament, the Storting. The first reaction of the Government was to put the road on ice when their white paper on the future of Svalbard was discussed in the Parliament. The Storting then formulated the Norwegian State Goal to make “Svalbard the best-managed Wilderness area in the world” and requested the Government to put in particular Svalbard’s tundra areas, such as Reindalen, under better protection in form of new national parks. What was the outcome of this tourism-conservation coalition? A series of new national parks (in addition to formerly existing ones, which protected glaciers and bare mountain areas) covering the main tundra and other valuable areas have been established. Today, almost the entire archipelago is protected with 7 national parks and 21 nature reserves. The Government of Norway released a special environmental law, with a particular focus on keeping the pristine wilderness. In addition, an environment fund has been established. Today, 60 000 tourists come to Svalbard by plane or ship and are required to pay a fee of 150 NOK. This fee is placed into the environment fund, which is used every year in a transparent way for education and research projects for the management of tourism and protected areas. Therefore, Svalbard is not only one of the best-protected wilderness areas, it serves also as a leading LT&C example. This LT&C example uses entrance fees in a transparent and efficient way to benefit the management of protected areas. National parks in other parts of the world could learn from and potentially implement this example. Svalbard is increasingly visited and used to inspire people toward actions for nature conservation and caring for our global environment. The success of the joint action of tourism and conservation on Svalbard brought both sides further together. 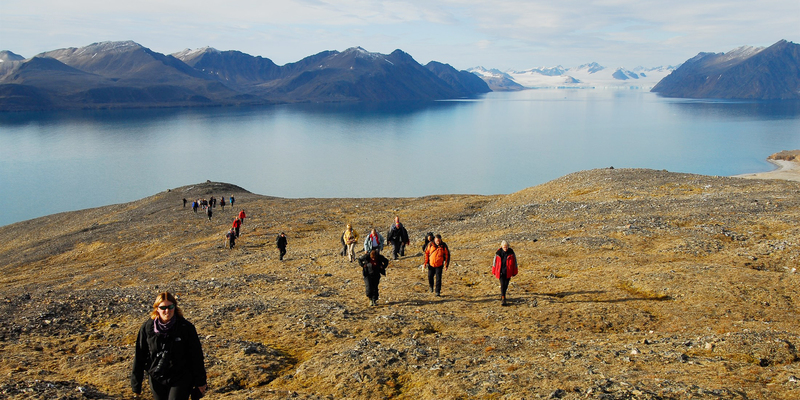 Under the coordination of WWF, a larger group of companies, agencies and experts from both tourism and conservation met several times in workshops on Svalbard and other places and produced a set of Arctic Tourism Guidelines. 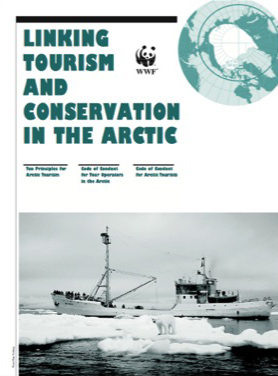 They were translated into several languages and distributed in the entire circumpolar Arctic and called “Linking Tourism and Conservation in the Arctic”. For a number of years an award, sponsored by the Finnish conservationist Heidi Andersson, was given to a tour operator, which demonstrates convincing examples of Linking Tourism and Conservation in the Arctic. Beginning in 2007, GRID-Arendal, a centre collaborating with UNEP, applied the concept globally and developed a project with the name “Linking Tourism & Conservation”. GRID-Arendal invited experts from different parts of the world to collect examples of different financial mechanisms of tourism supporting protected areas. In 2009 examples of support by ways of education or political action were also added, and the project became an official part of the Global Partnership for Sustainable Tourism (GPST). In early 2014, Linking Tourism & Conservation (LT&C) was registered as Norwegian NGO and as a continued development of this project. The global LT&C network of active tourism and conservation engaged members is seeking to create more LT&C examples, worldwide.